Tom Holland's version of Marvel's marquee webslinger is coming back in a big way, trotting the globe like you've never seen him before. Whatever ultimately happens in the fight against Thanos in Avengers: Endgame, it looks like Peter Parker is going to turn out okay — as though there was ever really any doubt. Now he's back for his second solo adventure in the Marvel Cinematic Universe with the Spider-Man: Homecoming sequel, Spider-Man: Far From Home. The new movie catches up with the friendly neighborhood Spider-Man as he heads out of Queens for a field trip through the best touristy vistas that Europe has to offer — but it's not all fun and games on this journey abroad. Instead, Peter's vacation is going to be turned upside-down by a group of diverse, high-powered supervillains, the likes of which have never before been seen in a live-action Spider-Man adventure. How's the wall-crawler going to handle being so out of his element? Let's break it all down with some small details you may have missed in the movie's first trailer. 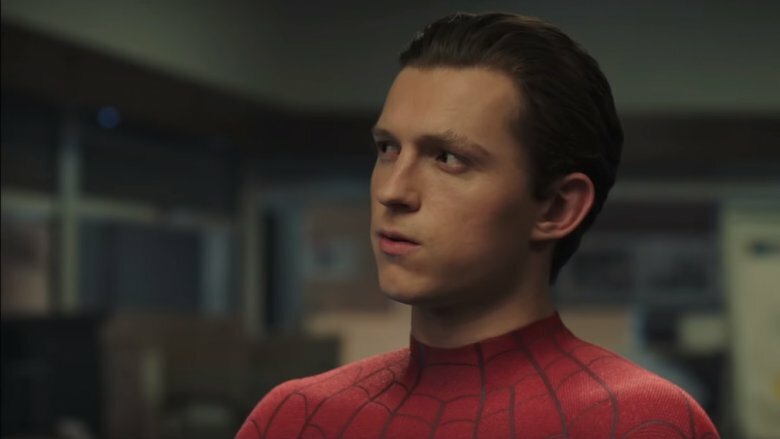 So far, we've gotten to see Tom Holland's Spider-Man show up in four different movies in the MCU — and it seems like every time he re-emerges, someone's gifted him a brand new suit. 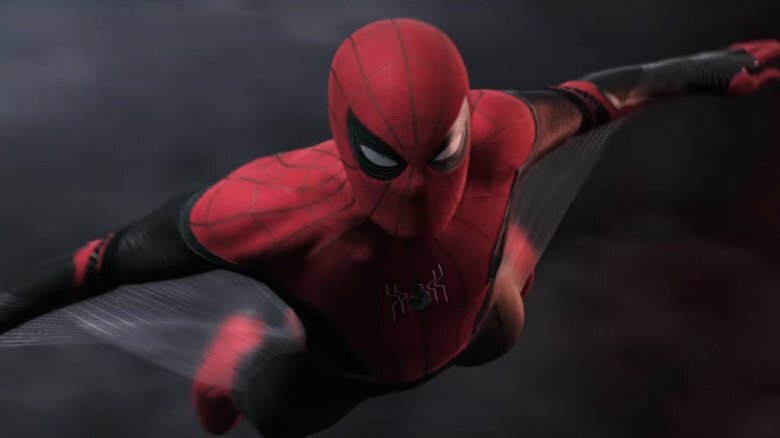 Much of the first Far From Home trailer showcases Peter making his way around Europe in a sleek new suit, designed with red and black colors. It generally looks a lot like the red/blue suits he sported in Captain America: Civil War and Spider-Man: Homecoming, including one key accessory on display: webbed winglike gliders threaded underneath the suit's arms. You probably caught the web wings on your first viewing of the trailer, but you might not know that this design has a history that goes way back. The web wings were a part of the very first designs for Spider-Man from character co-creator Steve Ditko, who originally established the wings as a regular part of Spidey's suit. As other artists took over the duties of drawing Spider-Man, the wings became an inconsistent feature, eventually growing relatively uncommon. They may look like sleek, high-tech new additions to Spider-Man's arsenal, but they're actually as old as they can be, and should come in handy for helping Spider-Man stay airborne while he's away from the high-rises of his New York City home. 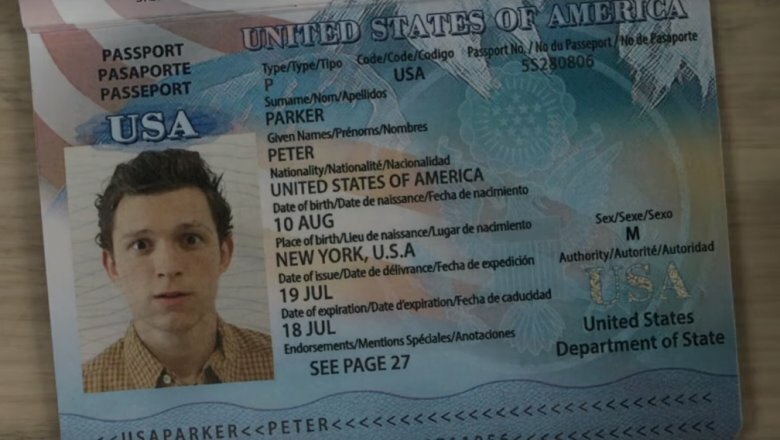 The first Far From Home trailer includes a close-up look at Peter Parker's passport, in which Tom Holland still somehow manages to look like a movie star, despite a gloriously goofy headshot. While the passport lacks specific years on any of its date sections — too bad for you, MCU timeline nerds — it does include a cute nod to Spider-Man's real-life comic book origins. Pausing the video to take in all the details, viewers may notice that Peter's birthday is listed as August 10, a seemingly inconsequential bit of trivia. What you may not have realized is that August 10 really is the day that Spider-Man as we know him was born, with the character making his first appearance in a comic book on that date, way back in 1962. The specific issue that Spider-Man comes from isn't an Amazing Spider-Man comic, but rather the 15th issue of Marvel's Amazing Fantasy series, written and penciled by Spider-Man co-creators Stan Lee and Steve Ditko. While the character's origins would be told and retold many times over the years to come, all the details are there in his initial appearance — and they still hold up decades later. Making August 10 Peter's canonical date of birth in the MCU is a great tip of the hat to the real-life day that got this whole franchise started. In an act of mercy to moviegoers everywhere, the MCU's entries in the Spider-Man canon have spared us all from seeing a third death scene for poor old Uncle Ben. Sure, sure, "With great power must also come great responsibility," but we don't need to see Ben eat another bullet to get the point across anymore. While the character played a major part in the Tobey Maguire and Andrew Garfield Spider-Man movies, Peter's beloved uncle isn't expected to make an onscreen appearance in the Tom Holland movies. But despite his physical absence from the franchise, his presence still looms large over Peter Parker's story. In Spider-Man: Homecoming, Peter alluded to a desire to protect Aunt May from undue, Spider-Man-related stress after "everything that's happened with her." It's a great way to tell the story that so many of us already know, letting viewers engage with the movie by filling in the blanks themselves. 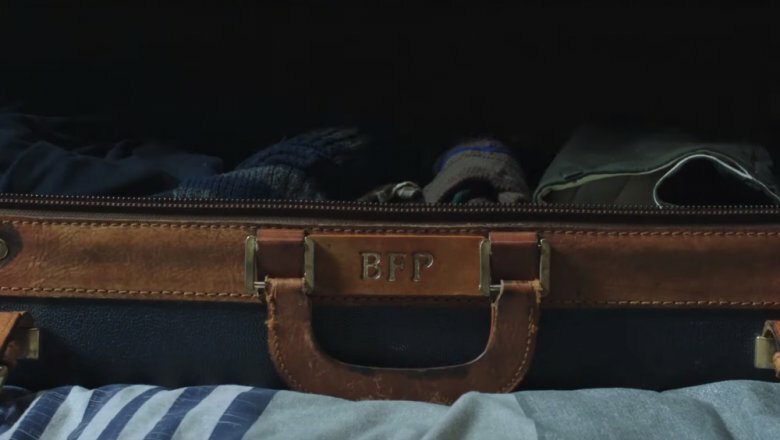 Far From Home takes this thread further with the initials "BFP" stitched onto Peter's luggage, visible in the center of frame while he's packing for his trip to Europe. It's not a stretch to assume that these initials allude to Ben Parker. It's a heartwarming, bittersweet touch to include in the movie, implying that no matter where Peter goes on his adventures, whether it's across the pond to Europe or beyond the stars to Titan, he'll always be carrying a little bit of his Uncle Ben with him. It's almost amusing how determined the first Far From Home trailer is to ignore the events of Avengers: Infinity War, as though Peter Parker isn't dead as a doornail at the time of the teaser's release. Nothing to see here, folks — Peter's fine, Earth is fine, and Spider-Man's reputation as Queens' own superhero couldn't be any better. It's a great day in New York City. Thanos who? 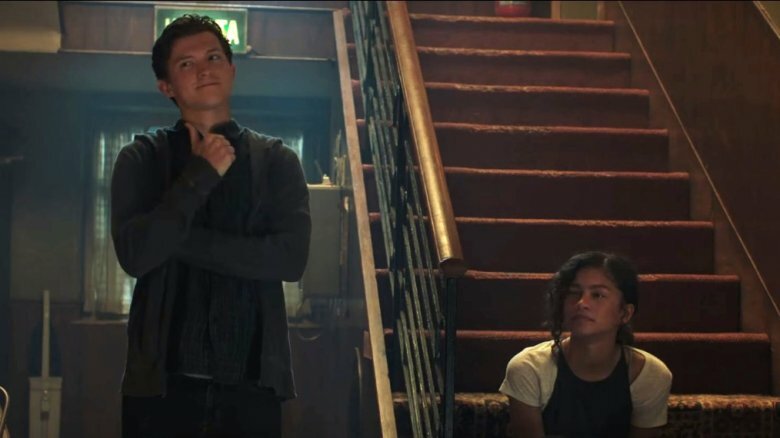 Picking up where the last Spider-Man movie left off, Far From Home's first trailer starts with Spider-Man and Aunt May standing side by side at a charitable benefit, with May having full knowledge of the superhero's real-life identity. 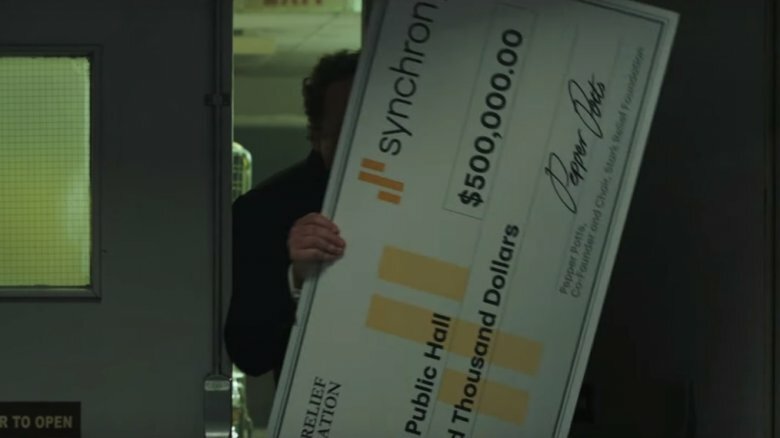 Peter's worlds further collide when Happy Hogan, Tony Stark's loyal, consistently harried assistant, shows up to the fundraiser with a gigantic novelty check from the Age of Ultron-era Stark Relief Foundation, signed by none other than Pepper Potts. The sequence of events seems to imply that whatever happens in Avengers: Endgame, Pepper Potts will make it out alive — otherwise this reference would come off as a little bit morbid. One thing that's less clear is just exactly what happened to Tony Stark. Iron Man was a pretty big part of Peter's life in Homecoming and Infinity War, and the presence of Happy and Pepper with Tony nowhere in sight is a little bit worrisome. We don't want to draw conclusions. Has he at least made it back from space yet? The Far From Home trailer introduces a surprising new threat to the world of the MCU — a handful of them, actually. While Spider-Man is no stranger to fighting aliens at this point, he's never had to face off with threats that are straight up magical — at least, not until now. The enemies all appear to be reminiscent of some key villains from Spider-Man's comic past, including Hydro-Man, Molten Man, Sandman, and potentially even Electro. But where those villains were all essentially street-level thugs with gimmicks, the bad guys besieging Europe's hottest tourist spots seem to be actual monsters of the sort rarely seen this side of Asgard. Is the Earth of the MCU being assaulted by some Godzilla-style, massive unidentified terrestrial organisms? Or have the villains of Spider-Man's rogues' gallery just seriously upped their game? 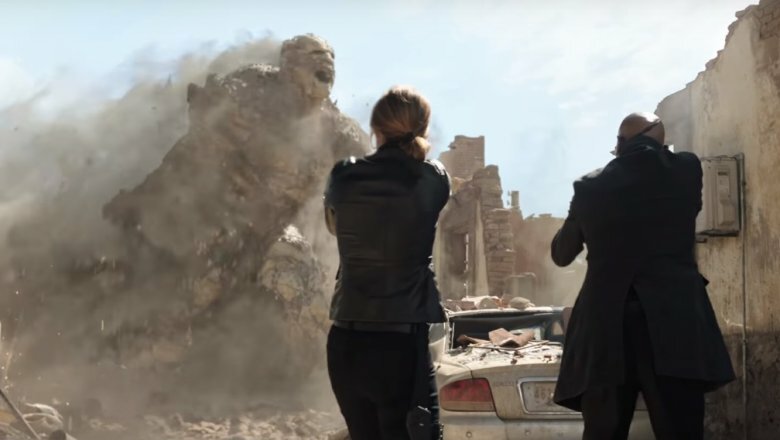 According to both Tom Holland and Jake Gyllenhaal, the supernatural-looking enemies in Far From Home are beings known as the Elementals. Gyllenhaal has described them specifically as "creatures" who are "threats to the world," whom he implies will require a team-up from Spider-Man and Mysterio in order to in order to take down. 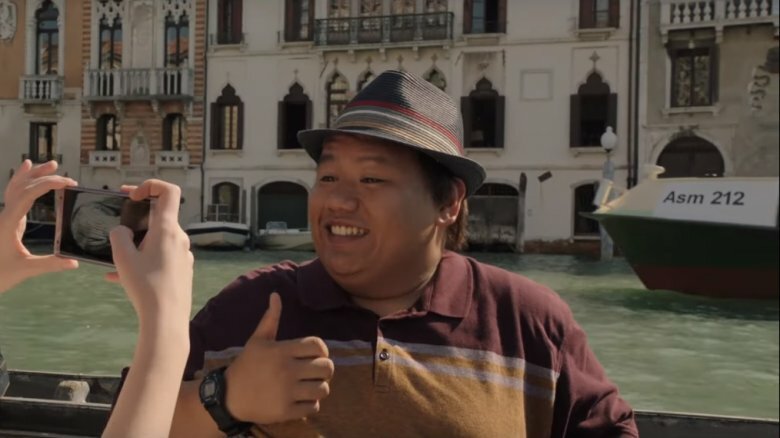 The first half of the trailer shows Peter and his fellow classmates enjoying their European vacation, leisurely floating their way down the scenic canals of Venice. As the trailer later demonstrates, it's a pretty perfect location to stage a fight against a gigantic, water-based supervillain — a set piece that's subtly foreshadowed in the background of Ned's photo op. While Peter's best friend and self-appointed "guy in the chair" gets a snapshot taken by the water — wearing his best fedora, naturally — a boat can be seen floating by in the background with "Asm 212" printed boldly on its side. If that combination of letters and numbers happened to tickle your Spidey-Sense, there's a pretty good reason for it. The text is a clear reference to the 212th issue of Amazing Spider-Man, published in January 1981. That issue is distinctive for featuring the very first appearance of Morris Bench — the villain also known as Hydro-Man. 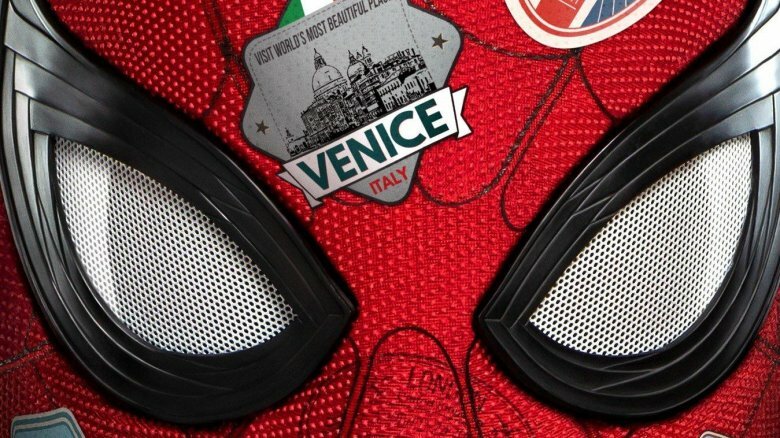 While it remains to be seen if Far From Home will feature that specific version of Hydro-Man, the movie definitely features some kind of water-based villain, probably arriving in Venice to make things wet and wild not long after Ned gets his picture. 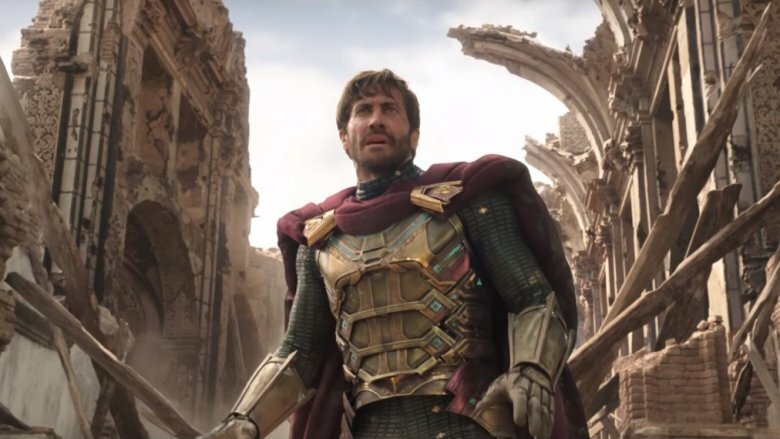 The tail end of the Far From Home trailer features the grand entrance of Jake Gyllenhaal as Mysterio, a comics character making his live-action debut in a surprisingly heroic way. Mysterio has long been a villain of Spider-Man's, but here he shows up to fight side by side with Peter in an unexpected face turn — or, at least, that's how things appear to be. The name "Mysterio" has been assumed by several different characters throughout Marvel Comics history, but Gyllenhaal was explicitly cast to play the original incarnation of the character, a man named Quentin Beck. In the comics, Beck is a stunt man and special effects expert for the movie business who uses elaborate illusions to appear as though he's wielding real magic, usually for the sake of committing crimes. It begs the question — is this trailer pulling a trick on us? After Mysterio shows up to take over the fight against the gigantic creature made of water, his exploits end up on a Venetian news broadcast, crediting the "mystery man" for fighting back the threat. Sure, it's possible that Mysterio is just here to help, but what if he knows more about these elemental monsters than he's letting on? Could this special effects wizard be using high-tech illusions to make these fights happen, engineering himself a heroic moment at the expense of countless civilians? We can't tell for sure just yet, but the way the fight works out for Quentin's benefit is definitely a little… mysterious. Plenty of fans are annoyed that Far From Home is being marketed with all these characters being alive and well before the answer as to how they're alive — and not traumatized from half the planet dying — gets revealed in the next Avengers movie. Whatever — trailer or no trailer, Cobie Smulders has confirmed she'll be returning for the Homecoming follow-up. What'll she be up to in Spider-Man's side of the MCU? SHIELD stuff, probably — it's hard to say, since the only shot you get of her in the trailer never displays her face. Even though it feels anti-climactic after Infinity War, we honestly like the confirmation that Maria Hill is still kicking. Cobie Smulders has been with this Marvel thing since the first Avengers movie in 2012, and we can't help but feel that this regular ol' human is seriously beating the odds by apparently surviving all the way into the MCU's Phase Four. Now how she's going to take on that gargantuan sand monster? Your guess is as good as ours, but we're not the least bit worried — if Thanos couldn't kill her, probably nothing will. One encouraging detail in the Far From Home trailer happens before Peter leaves the confines of New York City. 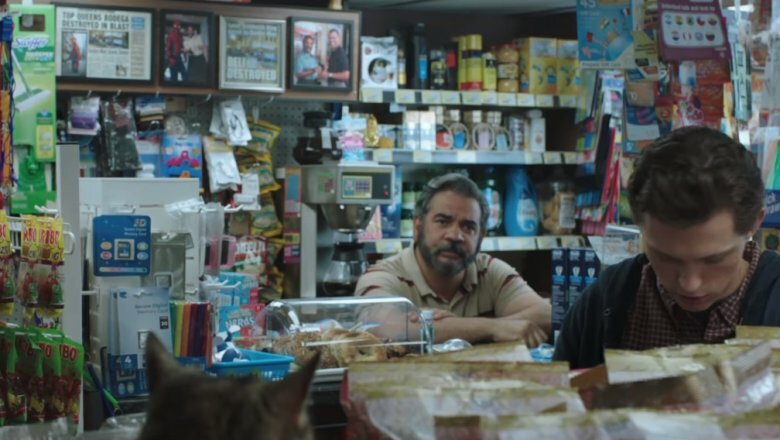 Before heading out across the Atlantic, he pays a visit to the new bodega location of the friendly Mr. Delmar, whose original store he inadvertently helped destroy while thwarting a high-tech ATM robbery in Homecoming. While he's still the same kindly neighborhood grocer we saw he was in the first movie, Delmar clearly hasn't forgotten about the violent destruction of his original store — and for whatever reason, he doesn't want his customers to forget, either. Up above the register, he's saved some framed newspapers with headlines and photos about the incident, when a Chitauri laser fired by one of the bank robbers blasted the deli to kingdom come. But though the accident was caused by a fight he saw Spider-Man participating in, he doesn't seem to blame him for the loss of his store. 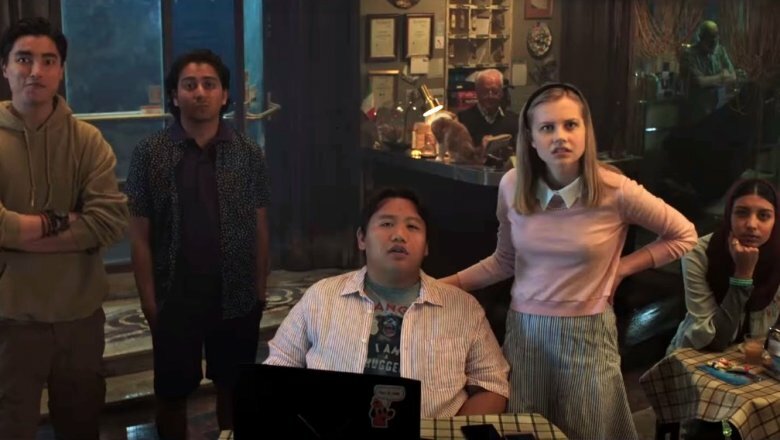 ​That is "This is fine"
While the students are resting up at their hotel after Mysterio steps in to save Venice, a small sticker can be seen on the lid of Ned's laptop, featuring a picture from a popular webcomic that you may remember going viral in 2016. In case you don't recognize the small sticker, it's of the "'This is Fine' dog," from a widely shared installment in the series Gunshow by artist KC Green. Little details like this (as well as Peter and Ned's consistently corny t-shirts) help realistically ground this version of Spider-Man in teen/meme culture in a way the previous live-action movies never really tried to. The comic, which is basically about being oblivious and cheerful while your house burns down around you, also embraces a philosophy that we feel would really come in handy in the constantly besieged world of the MCU. Despite all the frequent disasters and threats of annihilation, it still manages to seem like a pretty fun place to live. Dark Elves want to dominate the Nine Realms? This is fine. Wanda blew up a building, sparking several international incidents? This is fine! The Far From Home trailer kind of spoiled some parts of Endgame? That's… well, not ideal. But it's fine! No matter where they go in Europe, Peter and his field trip companions can't catch a break. Whether they're in Venice, Italy or London, England, the group keeps having their fun ruined by ending up in the crossfire of some supernatural attack. These kids' parents must be having heart attacks. Why hasn't this trip been cancelled? 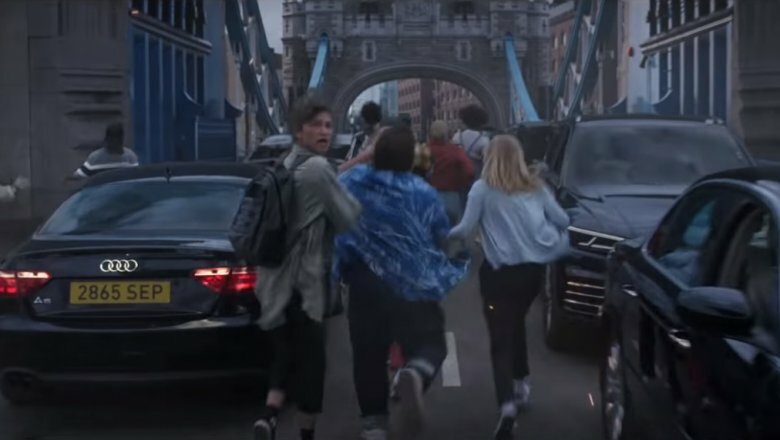 While out sightseeing in London, the students face an attack while in traffic on the Tower Bridge. 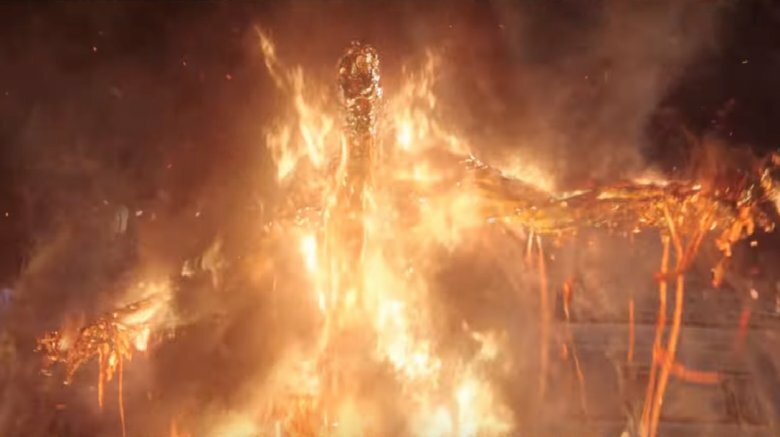 In the trailer, that attack is the only set piece where it's not entirely clear what's going on — a dark cloud envelops the bridge, emitting lightning and orange fire, but it's not clear what the cause of it is. The students don't waste time finding out, either. As the lightning strikes the ground around them, Peter's classmates — including Ned, Betty, and Michelle/MJ — sprint down the way between buses and cars to find safety. As they do, the camera passes by a couple of license plates. The first, on a red bus visible at 1:51 in the video, partially reads "MYS" — which seems to refer at least partially to Mysterio. The second, on the back of a nice, shiny Audi — clearly a favorite brand partner of Marvel Studios — reads "2865 SEP." As you might imagine from the suggestive initials, this too refers to the date of publication of a comic book, specifically September 1965's Amazing Spider-Man #28 — the first appearance of the Molten Man. Another license plate-related Easter egg can very briefly be seen at 1:39 in the trailer, while a giant sand monster rises up in the background, raising a ruckus. Nick Fury and Maria Hill stand in the foreground, partially obscuring the end of the plate number — but the first 3 digits are all you need to get the clue that seems to have been dropped here. The visible portion of the plate reads "463," seeming to refer to Amazing Spider-Man #4, published in September 1963, which featured the introduction of the classic Spidey character Sandman. Sandman previously served as one of the antagonists in Spider-Man 3, played by Thomas Haden Church. That movie's origin story, while altered slightly from the comics, kept Sandman as a New York City street thug, making it highly unusual for the character to show up here in Europe. Clearly, things have been switched around for these elemental monsters — but despite what Jake Gyllenhaal and Tom Holland have appeared to insinuate, these villains do not seem to be the actual Elementals from Marvel Comics. If they were, none of these debut comic Easter eggs would make any sense. Coupled with previously reported leaks regarding the names of LEGO toy set tie-ins, which included the names of Hydro-Man and Molten Man, and it sure seems like these so-called monsters are repurposed human villains from past Spider-Man stories — an interesting wrinkle in what's starting to look like a rather twist-filled plot. Aunt May and... Uncle Happy? During the opening scenes of the Far From Home trailer (the domestic version, at least — the international version kicks off a little differently), Peter watches as Happy Hogan and Aunt May flirt with each other. Shooting a sly look at Happy, Peter asks what's going on. What seems to be going on is that Happy and May are already dating at this point in the movie, having kept it something of a secret from Peter up until now. Unverified plot leaks and rumors swirling around online have indicated that Happy and May would be in a relationship with each other during Far From Home, but the line of dialogue that really sets off sirens for that potential development is when Happy compliments May's new dress. She asks how he knows, and he doesn't seem to want to get into it — not in front of Peter, at least. It would seem like the only way to know the details of May's wardrobe — especially for Happy, who doesn't really have a reason aside from Peter to be in May's orbit — would be if they were spending a lot of time together, socially, without Peter knowing. In Homecoming, at least, Tony Stark was always the flirty one when it came to Aunt May. As it turns out, May might have been single and looking — but she was looking past Tony, apparently to the guy who really does all of Stark's work. If true — good going, dude. There are lots of ways to pay homage to old comics when it comes to movie adaptations. Outside of calling up Stan Lee, which is sadly no longer an option, you can fill every license plate with dates and issue numbers, or fold creators' names into the backgrounds of shots — like the way the Venom movie does, to name one recent example. Far From Home also manages a shout out in this style, specifically one for J.M. 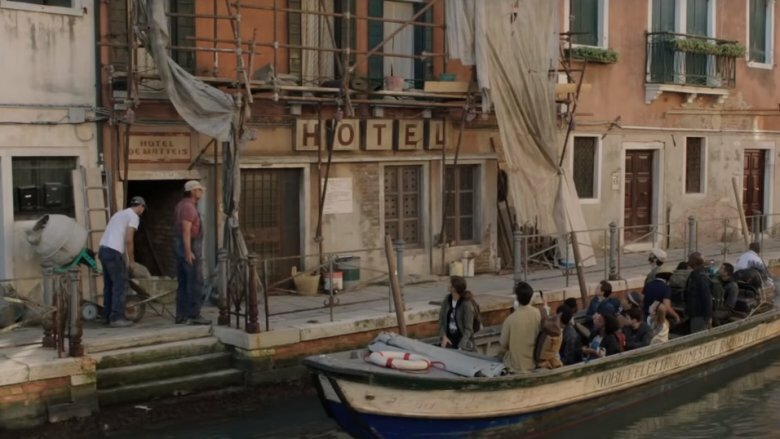 DeMatteis, for whom a hotel in the movie's version of Venice is clearly named. DeMatteis is a writer who's worked with most of the major comic book companies, including over 300 issues with Marvel Comics alone. A significant portion of his oeuvre involved material he wrote for various Spider-Man comics, with significant arcs including "Maximum Carnage," "Kraven's Last Hunt," and the Harry Osborn/Green Goblin-centric "The Child Within." His work in the early '90s on The Spectacular Spider-Man is regarded as having a darker, more introspective tone than previous Spider-Man series, but it doesn't look like that aspect of his work is carrying over into Far From Home, which looks set up to be just as fun — and flat-out funny — as Homecoming was in 2017.